Starbucks tried to penetrate the Australian cafe market by opening 84 stores, only to close 61 of them because they could not compete with the small independent stores. 95 percent of the cafes and coffee shops in Australia are independently owned, with big chains like Starbucks making up the remaining 5 percent. Interestingly, Starbucks’ first store in Australia opened just one block away from my own cafe in Sydney, so I got first hand feedback from my customers on Starbucks’ potential threat. The concern I had before they opened dissipated within a week. I concluded very quickly that Starbucks was good for tourists and those folk looking for brand association, but their appeal to the quality-espresso-seeking locals was limited to just one curious trial. Here is how the small independent Australian cafes and coffee shops countered the invasion of the global giant Starbucks and won. Offer the espresso-coffee-brew method only. Build your entire offer around espresso and forget about all other coffee-brew methods that Starbucks offers. This gives you a focused niche reputation, fewer management issues, less serving-space clutter, less customer confusion, fewer capital costs, and the opportunity to be the best at the one thing that matters in building a viable and sustainable coffee business … fine espresso coffee. Copy the Italian espresso culture. Copy as much of the Italian coffee culture as possible; that is another country where Starbucks has few stores, because I suspect they know they can’t compete with the existing independently owned espresso bars. For example, Italians know that big is not better; in fact, big drink servings typically generate a poorer quality output and rarely leads to much-needed multiple sales. Learn to make coffee the Italian way because it was the Italian immigrants that taught Australian baristas how to make the quality of espresso coffee that Starbucks found so difficult to compete with. Without being snobbish, Starbucks espresso just does not reach the benchmark required of fine Italian espresso coffee. Just ask an Italian who has tried Starbucks! Unlike Starbucks, Italians don’t need to add syrups or special sweeteners to their coffee to make it taste good. Forget the Starbucks-style marketing hype, the special merchandising, and the roasted bean sales. Just sell the finest espresso coffee drinks you can make to every customer … every time. Take the time to learn the art and science of fine espresso making. Anyway, your best margins are in the prepared drinks rather than the roasted beans and merchandise, so put all your efforts into your product with the highest profit: the manufactured drinks. Make your store a “home away from home”. Promote a more warm, welcoming, and friendly environment than Starbucks’ style of self-promoting visuals, structural sameness, and regimented layouts. Unlike other service and retail businesses, customers can engage multiple times per day with a cafe or coffee shop, so make them feel like it’s a “home away from home” in your cafe with interesting and changing visuals, a variety of seating arrangements, and let the customer alter the furniture to suit themselves. Even put together a bunch of off-beat, eclectic, and quirky furniture pieces. It’s OK to be familiar with your customers. Chains like Starbucks can’t risk their brand value by allowing service standards to be determined by their transient university student staff, so they create and enforce strict codes and processes for “serving” customers, which I think is inappropriate for the high-repeating clientele. Long-term independent cafe owners are not so constrained and can leverage the opportunity that multiple visits create, to become familiar with their customers. So get to know your customer’s names, learn their drink preferences, chat about all sorts of things that friends do, and trade the professional process-driven service for a very personal and familiar one. Your customers will love it! 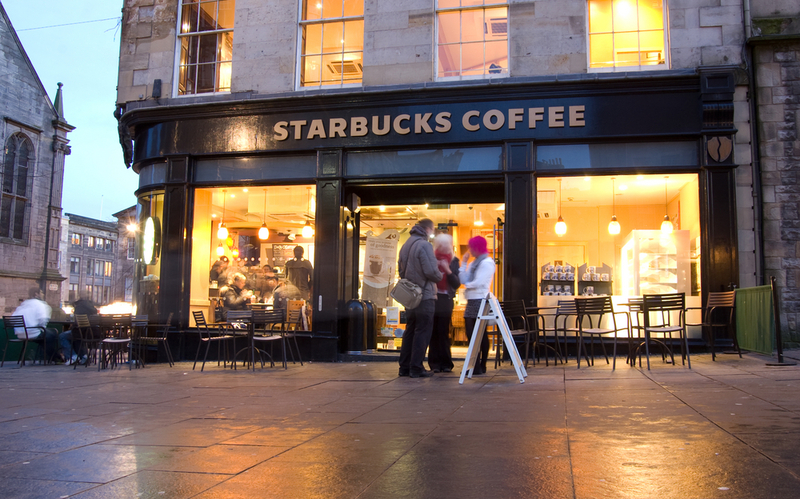 Avoid the tourist locations- Starbucks’s marketing and global presence gives them a huge competitive advantage in tourist areas because they have a brand that tourists trust, while your brand is an unknown to tourists and perceived as a risky option. The greatest competitive advantage for independent stores is next to or under office towers in the central business districts or in areas that service a static repeating clientele. A study of the Starbucks stores in Australia reveals that most would be classified as serving predominantly tourist markets. Don’t copy Starbucks’s high profile/high rent strategy: If you build your business on consistent high-quality espresso, your devoted and addicted customers will “go the extra mile” and walk past the main street Starbucks locations to the more obscure low-rent ones anyway. Your customers will love introducing their friends to these hidden gems, which once found can attract as big a repeating and referring clientele as Starbucks’ Main Street stores, but at a significantly lower rent.